So how exactly did those primates in Planet Of The Apes (1968) take over the planet? 43 years later, Hollywood provides the answer: the humans did themselves in with bad science. 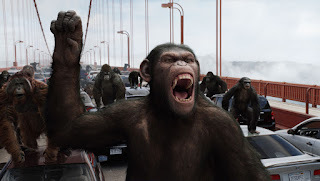 In a story of medical experimentation run amok and greedy corporations pushing for the next miracle cure, Rise Of The Planet Of The Apes warns that the law of unintended side effects could be the last law that matters as far as humans are concerned. Scientist Will Rodman (James Franco) is working for the Gen Sys corporation, testing on apes drugs that may treat Alzheimer's disease. The ALZ-112 compound appears to show tremendous promise, but after an ape runs amok in the lab, Will's boss Steven Jacobs (David Oyelowo) pulls the plug on any further tests. Undeterred, Will covertly takes one baby ape, named Caesar, home, and persists with testing ALZ-112 on him. Will has a personal motive: his father Charles (John Lithgow) suffers from severe Alzheimer's. When Caesar starts to demonstrate incredible mental abilities, including remarkable sign language proficiency, Will injects Charles with the compound; he is almost immediately free of the disease. The years pass; Caesar grows into a very bright ape, and Will marries Caroline (Freida Pinto). Charles' immunity system unexpectedly develops antibodies that counter the effects of the treatment, and his Alzheimer's returns with a vengeance, ultimately killing him. Caesar starts to develop an unhappy awareness that he is a unique pet, and his behaviour becomes more hostile. Will pushes on and develops the even more powerful ALZ-113, and sensing the potential for a miracle drug, Steven approves a new round of aggressive, uncontrolled test treatments on a new batch of apes at Gen Sys. Caesar eventually violently attacks a neighbour and is consigned to a primate holding facility. While in captivity and held under inhumane conditions, Caesar sharpens his awareness, and starts to influence and command the hundreds of other apes held in grimy conditions. He finally leads a rebellion and assembles a formidable army of apes while ALZ-113 proves to have some very nasty side effects on humans. Rise Of The Planet Of The Apes is more thoughtful science fiction than thriller, and most of the brisk 105 minute running time is consumed by setting up the science and then the ape evolution towards rebellion. The final act crams in all of the action, most of it on the Golden Gate Bridge, and while the mayhem is appreciated and needed for the plot, it is also the most routine and least inspired part of the movie. In a film dominated by the apes and the computer geeks programming their remarkable on-screen appearance and movements, the human acting talent takes the seat at the far back of the van. James Franco is worried about the science, worried about his father, and worried about Caesar. In short, he is worried, and he goes though the film making sure that everything knows that he is worried. Freida Pinto must hope that life after Slumdog Millionaire will consist of roles better than the hastily appended girlfriend / wife who contributes pretty much nothing to the proceedings. John Lithgow has the showy mental patient role and grills it to carbon, and luckily he does not appear in any of the same scenes as David Oyelowo, otherwise they would be competing for large bites from the same chewable scenery. But neither director Rupert Wyatt nor screenwriters Rick Jaffa and Amanda Silver pretend that the movie is about acting talent. This is a science story where the apes are both the underdogs and the pre-ordained victors. The apes are therefore entrusted to solicit the sympathy, and this objective is achieved with ease thank to stellar performance capture technology. Caesar and the rest of the apes display subtle changes in emotion with spectacular success, to the point that the apes' expressions effortlessly convey their innermost thoughts. Rise Of The Planet Of The Apes will never be accused of being a classic, but as a technologically superior prequel to a well-loved movie landmark, it serves its purpose.